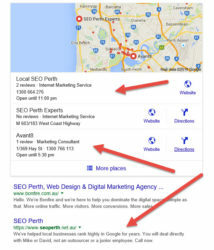 I’ve previously noted how important Google Plus is becoming to both search engine marketing and social media marketing. But watching this video on how overly biased Google is in offering Google+ results makes me think perhaps I underestimated just how important. Don’t worry so much about whether or not the bookmarklet demonstrated in the video is needed – just look at how many times the social results are reordered. Get on Google Plus. That’s a no brainer. Next build a Google+ Page for your business. Finally, figure out how you can best use Google+ to engender interaction with your business. Google+ is still so very new, no-one knows what’s going to work on it. It really is a case of trial and error. What might work for one person may not work for another. But like we did with Myspace, Twitter, Linkedin & Facebook, just being consciously active on the platform is the best way for you to get to understand it. Heck, you might get so good at “doing” Google+ that others want you to teach them how to do what you do. I may not have any answers yet on how to best utilise Google+, but recent developments have demonstrated beyond a shadow of a doubt that if you’re not at least on Google+ you’re going to get hammered by your competitors who are. It seems the confusion we had back in 2014 over Google+ was justified. Google itself doesn’t seem to know what it wants to do with the platform. We had it integrated with Google Maps (or Google Local, now Google My Business) and with Picassa, but now Google Plus is largely irrelevant. It didn’t have the social traction we expected. For a time, connecting your G+ profile to a website as an author would get your picture displayed in the SERPs. That was cool while it lasted, but it probably put too much strain on Google’s servers for the benefit it gave. What is G+ Like Now? As of July 2016, Google+ is a ghost town. You get a profile when you sign up to things like Youtube, and it’s deeply integrated with Youtube’s comments and reviews on Google maps. If it weren’t for those two, I’d guess the platform would be shut down. You have to hand it to Google though; not content to rest on their laurels, they’re always trying things to improve their offerings and market reach. They might have a monopoly on search in many countries, but that doesn’t seem to be slowing them down. Sure they have failed in a number of projects, but that process brought us maps and google local, which are now as deeply integrated with many people’s lives as search. While all those tests were going on, it was really important from a branding perspective to be active on the platforms. Unfortunately that did not translate to better search engine rankings as many of us expected. You can’t get away from having a profile, so that will continue. It’s useful for semantic integration and it will be interesting to see whether Google integrates plus profiles with what (if anything) replaces freebase in the semantic web. You’ll still sort of use the platform when you do local business optimization. I’ve not seen any particular search engine benefit from commenting on Youtube videos, though that may help you rank on Youtube. Essentially, I think we’re well past the time of a heavier Google+ bias. I joined Google+ a while back but was hesitant. Glad to know it was worth it. I was reading about this when they sent out a post telling all about it and how great it was going to be. I was hesitant just like Niall but the main difference is I still haven’t signed up for it. I want the best of both worlds here and I know I can’t do that. I have to trust you and the other readers to not steer me wrong. Don’t worry Joseph, it’ll be worth it. And hey, it’s free. What have you got to lose? I think this could be a blessing in disguise. This could be an open opportunity for anyone who has been struggling with getting search engine results to get in on the ground floor of Google plus and shoot up in the rankings. I’m going to get on this right away and create a cool plus page today. There is nothing wrong with using Google’s own biased algorithms for our own benefit. I can’t wait to see the results. This was very interesting I was thinking that I was going to change services and things but I am now reconsidering that. Google is making a lot of different changes here lately and some of them sound really good but I am leery about anything new that comes out. I am a creature of habit and I don’t care for change when I finally get used to something. I think I might have misunderstood the importance as well, I didn’t realize that it was going to be bigger than Facebook and Twitter. But as you stated in your post I have to worry about me and my business not them, they are big enough that I don’t feel it will hurt them to terribly bad. Don’t you figure that most people will use both simply because they can use this for business only? Yeah, I don’t know if it’ll ever be bigger than facebook for people’s personal lives, but it’s definitely huge for business. Particularly search engines. One possible future scenario is that people will “live on facebook, work on Google+”. I think that what Mike is saying here is how it will work. People are going to set up separate accounts for their lives and their business and Facebook is going to be about life and friends and personal things. Google plus Is going to be all about making your business bigger and bringing in customers. I like the idea of having everything separate again that will be a big plus. I hope that Mike is right and that most people do set up separate accounts for their personal life and their business. You have done a great job of pointing out the benefits of Google + and I hope that people will take notice. When someone in the business field is looking for something they don’t go to Facebook they do a google search. This would be a great way to be found. You have done a great job of pointing out the benefits of Google + and I hope that people will take notice. When someone in the business field is looking for something they don’t go to Facebook they do a google search. This would be a great way to be found if you already have a google plus account in place. I think it is a great idea, thank you.